Adidas unveiled the new Euro 2016 Germany Home Kit on 9th November in Berlin during a concert in front of 700 football fans. 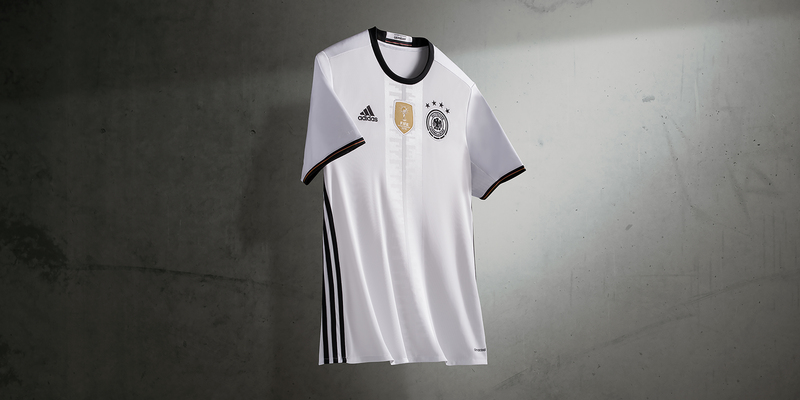 “Die Mannschaft” will look to dominate the Euro title in France in their classic white-and-black design Germany shirts. The Germany home kit also introduces a new positioning for the iconic three stripes from Adidas. The white jersey combines with black shorts and black socks aim to create a timeless classic outfit which fans of all generation can easily associate with the national team. On the sleeves, the years of the famous Germany victories (successes at previous World and European Championships) are shown. The new Germany home Euro 2016 kit will be worn on pitch by the German players on Friday, 13th November, during Germany’s friendly international against France. The new Adidas Germany 2016 Home Shirt features the iconic white colour as the main colour with the Adidas, DFB crest and the gold FIFA World Cup Winners Badge feature on the front. The most remarkable feature of the Germany Euro 2016 shirt is the new positioning of Adidas stripes – the iconic stripes are placed on the side instead of the sleeves.